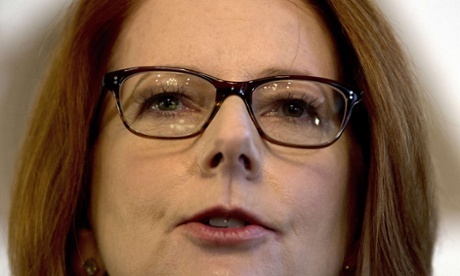 Katharine Murphy pens a brilliant analysis of Australia's first female Prime Minister for The Guardian. But try as she might, she lacked convincing shorthand to deploy to voters. She was intensely private, contained, reserved – stubbornly enigmatic and withholding for a person so long in the public spotlight. She rationed appearances by her best self. There were glimpses of something that rang clear and true: the enduring values that drove the Labor agenda in this difficult term despite all the obstacles; the quest for a coherent legacy in the delivery as well as the dreaming; Gillard’s ferocity over the dispatch box; the exocet precision of that misogyny speech. Her pre-prime ministerial self would expand and fill a room, but would then retreat, abashed, in silent apology. What's 'the knitting controversy' all about? Good question, and hard for me to comment from this funny little town in Bavaria, but as far as I can see, it was just more relentless viscous attacking. Damned is she does, damned if she doesn't. That said, it (the photo of her knitting for the royal baby) did look completely out of character, except as the journo above points out, one of the problems is/was no one really knew much about her character at all. If, say, it had been the previous prime minister's wife, the dreadful 'keeping up appearances' Janette Howard, oh, then the mob, and the Murdochs, would have loved it all, clucking on, forelocks tugged. I think it is a mass-media thing, because in the flesh when I saw her at Hazel's "do" she positively glowed amidst her phone-camera-snapping admirers. And the converse of the mass media thing is crazy Mark Latham's famous comment about Rudd (liked by people who have never met him). It is really very complex isn't it, and endlessly fascinating as a document of the state of the country. I thought the link above was the best analysis I've seen so far (and the cement is far from dry) plus I wanted to date state it. Incidentally, when will you be back in our sunny (more soggy just now) land? Got back on the weekend.